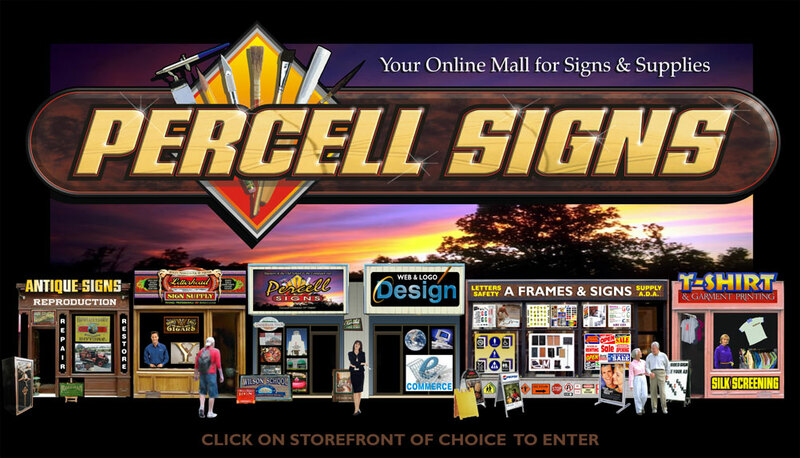 2 Generations of Sign Specialists, Featuring Custom or Pre made Products Retail for the Public & Professionals. Reproduction & Gold Leaf Restoration. when ordering our Pre made& Custom products at our Secure Online Sign Stores since 1998. Antique Reverse Gilded Glass Reproduction and Restoration Gold Leaf are services offered as title suggests. has created a new process for Reproduction and Restoration of Historic Lithographs for Antique Reverse Glass Signs. together's or socials for Sign Painters in which the Trade-Craft Techniques are Shared in a informal & non-formal Workshops. The Materials we use are often Esoteric in nature and made from Period Style Materials of a earlier Victorian Golden age. Pinstriping, Murals, Illustration and Many other Old School Sign Painter Techniques that keeps customers coming back. Don't forget to look at our Photo Section inside the Sign Shop. and Custom E-Commerce Stores for small to midsize companies that wish to manage their own site or Shopping Carts. ready to ship Banners, Traffic & Regulatory Warning Safety Marking Signage, Trade show Displays, Pre made Plastic & Acrylic Letters. We also have the Hardware for hanging or installing projects to help you when doing it yourself. Percell Signs Petaluma T-Shirt Silk-Screening, we produce a High Quality 100% Cotton T-Shirts & Sweaters only with custom artwork. we have 6-8 color garment printing available.